If you want your home to truly reflect who you are and how you live, finding the right accessories to reflect your lifestyle is simple. When you head to Muji, you’re sure to find something that can have pride of place in your abode. Its philosophy of simplicity and quality appeals to every kind of lifestyle. You work hard, play hard, and make art. To make your creative ideas come to life, you need quality tools. Set these up in your home office to get your mind busy even during your downtime: colored pencils (2) and a craft scrapbook (8) for your doodles; and a ruled notebook (3), a notepad (6), as well as pens and mechanical pencils (4) for your thoughts. Don't forget these desk essentials: a weekly schedule memo (1) to help you keep track of your appointments, a calculator (5) with a large display, and a three-tiered storage box (9) to keep your workspace organized. COOL FIND: City Desk London (7) — It's a quirky pen holder that can remind you of your favorite city or a dream destination. You love to entertain friends and family at home. You enjoy having company over and having good conversations with them over good food. Add these to the spread at your next house party: Serve finger foods and hearty soups in bowls (1) as appetizers. For a simple yet elegant table setting, use a small bone china plate (7), an ashwood tray (8), and sturdy tableware (9, 10, 11). 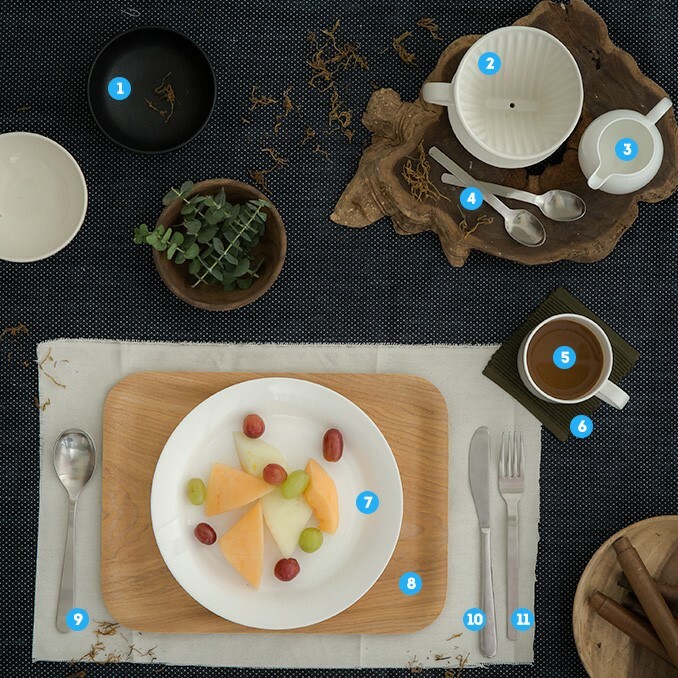 After sharing the meal, have some coffee served in a bone china mug (5); put a coaster (6) underneath it, and give each guest his own teaspoon (4). Offer everyone some fresh milk in the bone china creamer (3) to go with their joe. COOL FIND: Porcelain coffee dripper (2) — Prepare a fresh cup of coffee every morning straight from this. You enjoy staying at home together. For both of you, staying in is in, and comfort is a top priority. Make your nest even cozier with these finds that are perfect for lounging at home: cushioned (3) and cotton calico (4) slippers, and a fluffy pillow (5). 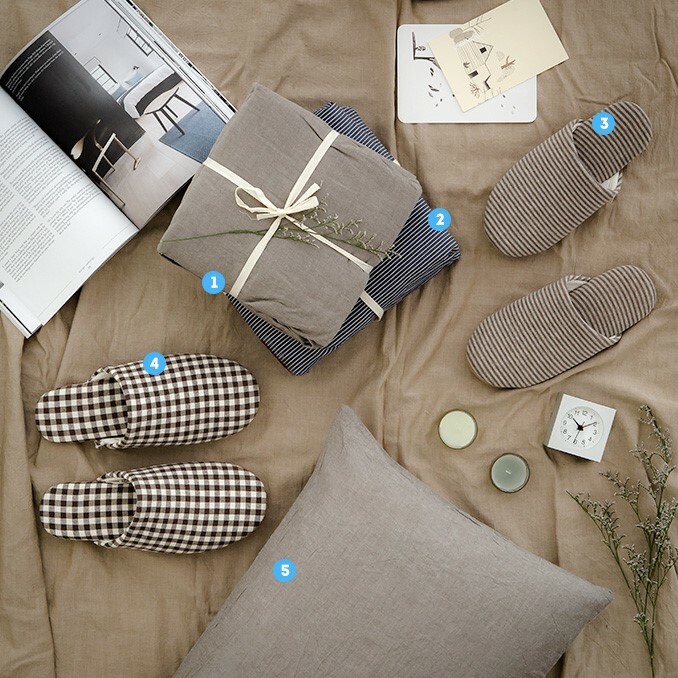 COOL FIND: Bed linen (1, 2) — Did you know that Muji uses the same cotton fabric for both clothes and linen? Your skin can enjoy the same level of comfort all day and all night. 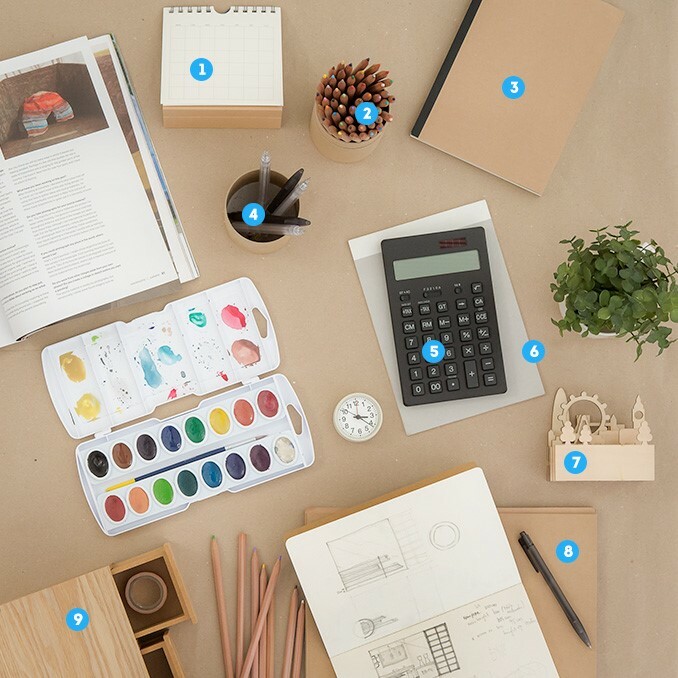 TIP: Plan ahead and consider opening a gift registry in Muji. 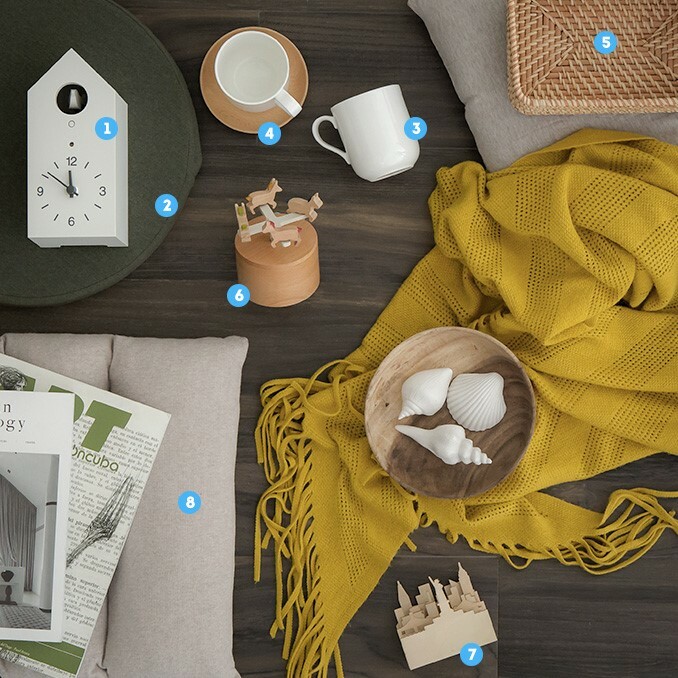 Moving in and decorating would be hassle-free if you identify and pick the items you need in your first home ahead of time. You and your young family have just moved into your new home. Prepare it for the many happy memories you’ll be making together in the years to come. Adorn your abode with these accessories: round (2) and square (8) cushions for comfy seating, a rattan basket (5) to organize knickknacks, and a merry-go-round music box (6) and City Desk New York as accents. When everyone is gathered in the family room, sip some hot cocoa served in a mug (3) and placed on a coaster (4). COOL FIND: Cuckoo clock — Be greeted by its soft, natural chirps. This clock also has two chime functions and a light sensor to avoid sounding off in the dark. You can spend hours in your kitchen whipping up baked goodies that wow. 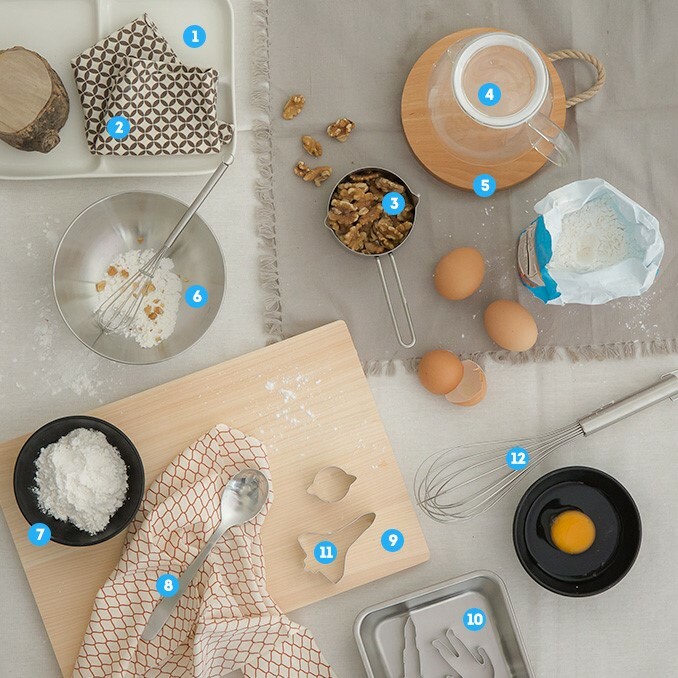 Every home baker knows that the right tools can make all the difference, so be sure to include these in your arsenal: a measuring cup (3), a stainless steel tray (10), a stainless steel bowl (6), wire whisks (12) in various sizes, a spoon (8) for tasting, different bowls (7) for sorting ingredients, and kitchen towels (2) for protecting your hands. Then, serve your goodies on a wooden chopping board (9) for a rustic touch or on a rectangular platter (1). These go well with coffee or tea served in a clear pot (4) placed on a wooden stand (5). COOL FIND: Space and astronaut cookie cutters — Skip the regular, round cookies, and serve a unique thematic batch instead. In the Philippines, Muji is exclusively distributed by Stores Specialists, Inc., a member of The SSI Group, Inc. It currently operates in six stores in Manila and one in Cebu. Muji is located at Bonifacio High Street Central, Power Plant Mall at Rockwell, Greenbelt 3, SM Mall of Asia, Robinsons Magnolia, Shangri-La mall East Wing, and Ayala Center Cebu. 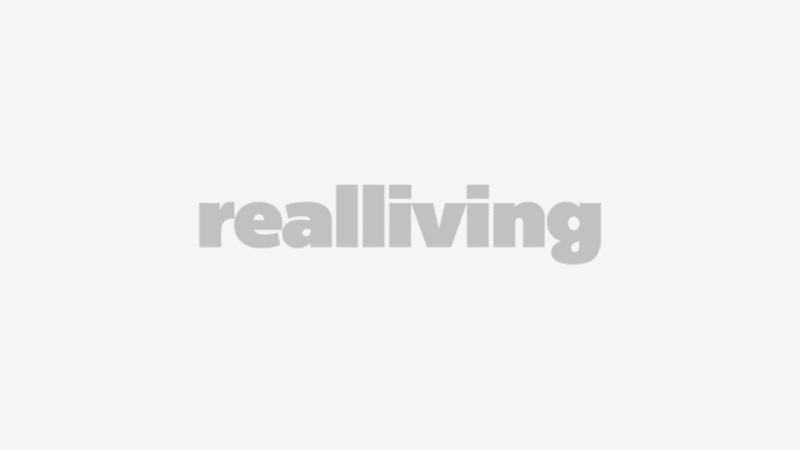 This article was created by Summit StoryLabs in partnership with Muji.